On October 12th, 325 competitors from across the country flocked to The Circuit Bouldering Gym for the 3rd annual Portland Boulder Rally. Competition was fierce with a stacked field of 27 professional athletes. The top 6 men and women advanced to the finals to battle for their share of a $10,000 cash purse. Top favorites Alex Puccio and Jimmy Webb took first place with Carlo Traversi and Angie Payne coming in second. Both men's and women's categories had a tie for third: Jon Cardwell/Paul Robinson and Nina Williams/Alex Johnson. Matty Hong and Isabelle Faus sneaked into 5th place to claim the final checks and Sierra Blair-Coyle and Matt Fultz placed 6th. 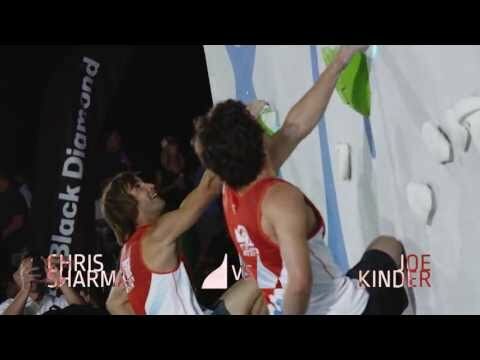 Watch the full archived live stream - including interviews with all the pros and complete finals commentary by Climbing Narc and Max Zolotukhin - at portlandboulderrally.com. and Alex Puccio! so strong! I think its a shame that what she wears, and more typically, how little of it she’s wearing, is the most common topic surrounding Sierra Blair-Coyle. She climbs pretty hard at competitions (I have no idea of her outdoor exploits) and yet I think she gets written off as merely eye-candy by a lot of climbers. That being said, a quick search with a few popular names leads me to believe she has the most facebook likes of any professional climber. (I could be wrong, but I couldn’t find anyone with more). Which definitely isn’t everything, but I think it puts out a kind of sad message to new young female climbers that the best way to get noticed is to wear as little clothing as possible while the cameras are rolling. She has more likes than the “fantastic five” or whatever you want to call them, Noguchi, Puccio, Stohr, Coxsey, and Wurm, as well as Chris Sharma, Alex Johnson, and Angie Payne all combined, with a few ten thousand to spare if my mental math was correct. The only 2 climbers I could find that came close were Alex Honnold and Sasha DiGiulian, but she beat both of them too (but not by much). I guess I just wish that one of the most popular faces of climbing wasn’t a girl that climbers mainly know as “that one chick who climbs half naked at every comp.” I’ll take Honnold and DiGiulian being very close as some consolation, but its still a little upsetting. Leave a Reply to Bee Click here to cancel reply.